We all see reality through a personal lens shaped by our beliefs, culture, religion, and experiences. The movie Roshomon was a brilliant example of this, where three witnesses to a crime recount different versions of what happened. When couples argue, they usually can’t agree on the facts of what happened. Additionally, our mind tricks us according to what we think, believe, and feel. These are cognitive distortions that cause us unnecessary pain. If you suffer from anxiety, depression, low self-esteem, or perfectionism, your thinking can skew your perceptions. 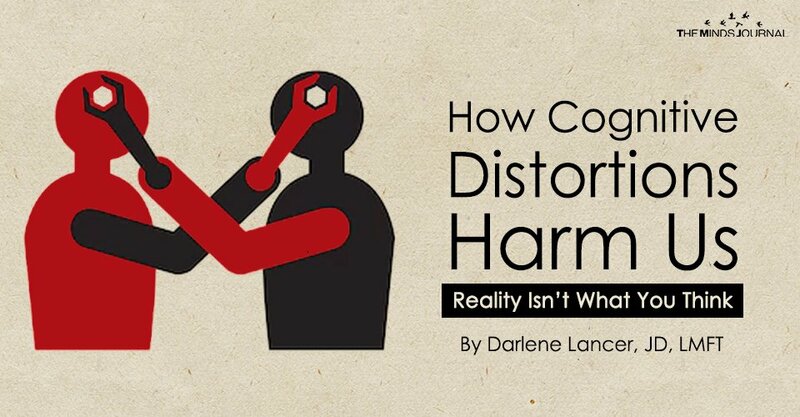 Cognitive distortions reflect flawed thinking, often stemming from insecurity and low-self-esteem. Negative filters distort reality and can generate stressful emotions. Thoughts stir up feelings, which in turn trigger more negative thoughts, creating a negative feedback loop. If we act on our distorted perceptions, conflict ensues that can give rise to unintended negative consequences. Magnification is when we exaggerate our weaknesses or responsibilities. We can also inflate negative projections and potential risks. It’s also called catastrophizing because we’re “making mountains out of molehills” or “blowing things out of proportion.” The underlying assumption is we won’t be able to handle what will happen. It’s driven by insecurity and anxiety and escalates them. Another distortion is minimization, when we downplay the importance of our attributes, skills, and positive thoughts, feelings, and events, such as compliments. We might magnify someone else’s looks or skills while minimizing our own. If you’re in a group sharing, you might think everyone’s pitch was better than your own. Stop comparing. It’s a self-shaming.